The circus comes to you! A great addition to any event or party, guests will have the chance to interact with David at the risk of learning something new, either about themselves or the world around them. Lessons in juggling, spinning plates, hula hoops, and other circus toys will engage participants and bring that element of fun you are looking for in your event. ​In this hands-on workshop, participants will learn familiar circus skills using recycled materials. From balance to juggling, this exciting and interactive lesson is sure to amaze. Bring at least three recycled plastic shopping bags to make your very own set of juggling balls! 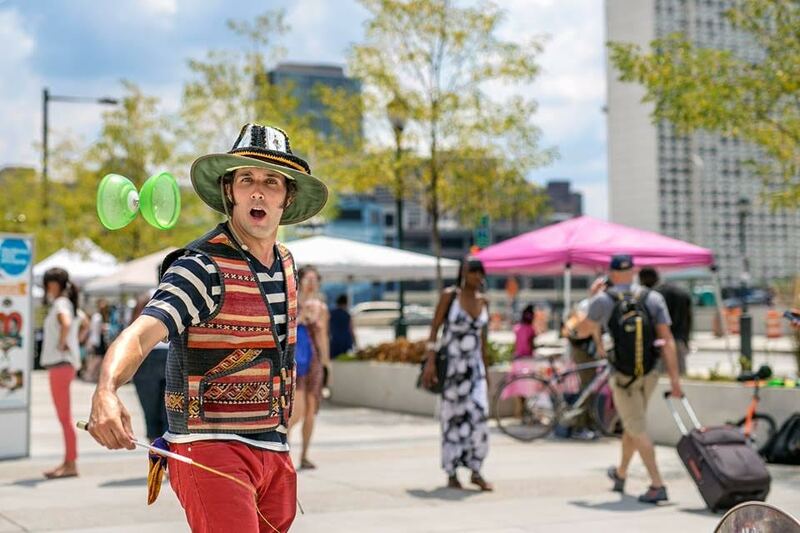 ​Diabolo Dave demonstrates Newton’s laws of motion and gravity with incredible feats of circus expertise; and he's not clowning around when it come to the physics of Juggling, Chinese yo-yo, and spinning plates. Education and physics will unravel the magic behind some of your favorite circus acts. Extraordinary juggling and balance are sure to delight in this educational event!